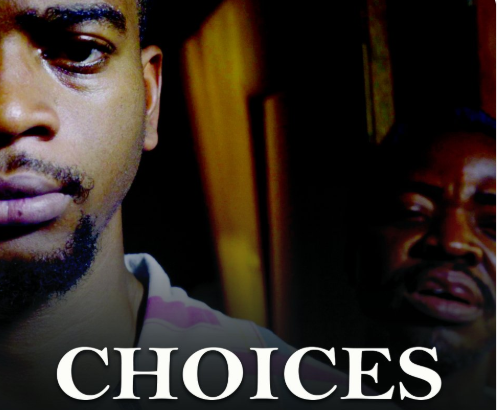 Artistry Media, the collective of Baridakara Nwilene (producer), Alfa Faruk Umar (writer), and Joshua Tosto (director) and announced as winner of the $5000 grant courtesy of the Lagos Film Academy Film for Life project have released their short film titled Choices. Aligning with Nigeria’s election season which the theme of the film project leans towards, the film features Olumide Oworu in a lead role. Oworu has been steadily building a portfolio in television, starring in the youth-leaning show on sexual health Shuga and sitcom The Johnsons. He competently takes on the role of Tega in Choices, the only son of a family whose father Efe has over the years been a political thug and a mercenary who disrupts electoral processes. This year, Tega faces a critical choice that could change not just him and his family, but the entire community. The four-minute film uses the squalor of a community as an aesthetic, a nearly-impoverished family trying to get by as the political climate announces itself. Tega chooses not to be a mercenary for power-hungry politicians, staring at an open wardrobe full of weapons. He soon realises that the power to change things is in his permanent voters’ card. He then galvanizes his community to vote and participate in the elections. It’s a simple message, but I wish the story had a bit of complexity, a turning point that really draws the audience in. The film stars Tessy Brown (Sophia, The Lost Heir), Ikponwosa Gold (Dominoes, Wetin Dey, Confusion Na Wa, Oga Bolaji) and Heavens Obule and Idoko Gold. Here’s the short below.